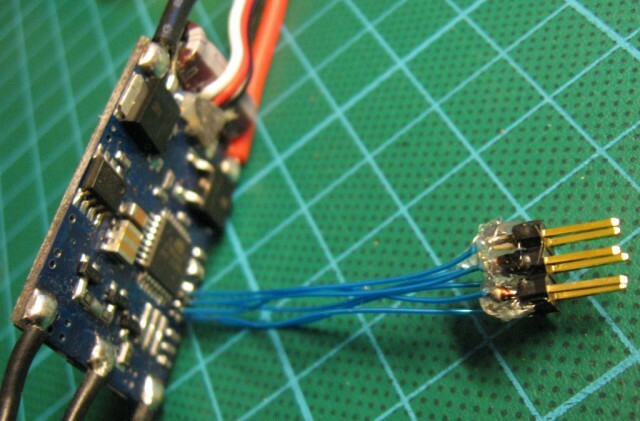 ESCs are needed for every multirotor. Some are cheap, but dedicated to planes (slower response), some have extra features in firmware, but costs a little more. At start: remove shrink-wrap from ESC. The best and safest place to cut it is on one side. As you can see on above picture there are 6 pads. But bad news is that some are clean and flat, and other one are with ‘balls’ of tin (and on each ESC there were different combination of these). 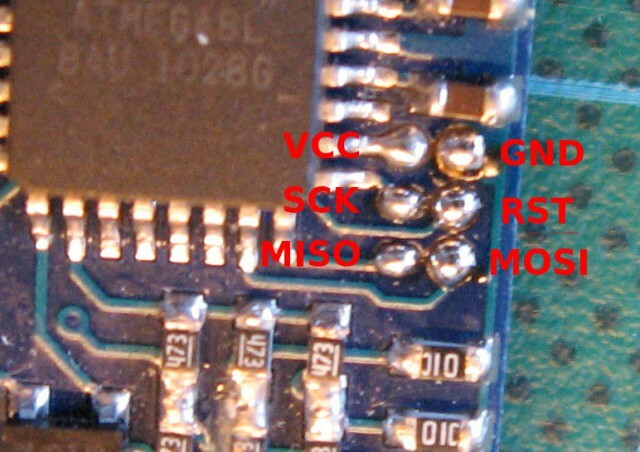 This makes difficult to make some programming connector to touch reliable to these pads. So, only soldering left for me. Then I soldered header pin connector with very thin wires (Kynar wires, diameter 0.2mm/AWG32). If you first tin end of this wire, then soldering it to the ‘balls’ on pcb is easy (with magnifying glass 🙂 ). And just connect it to USBasp and program it! 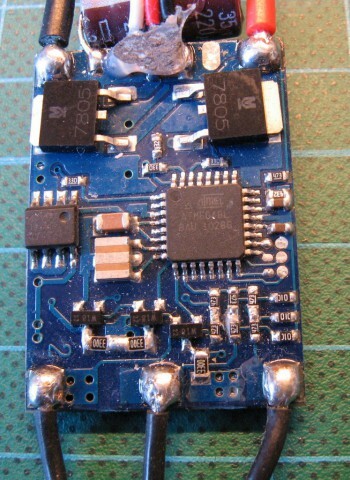 In my opinion this is not needed for this ESC as it has quartz oscilator and will be controlled by MultiWii board instead of receiver. If you don’t want or you are unable to compile this code, firmware compiled by me is here. In this step you need Avrdude or other AVR programming software which allows to flash ready firmware in Intel Hex format. avrdude: reading input file "tp_8khz.hex"
Above code contains a bootloader, so further reprogramming could be very easy and could be done using only BEC/PPM connector. 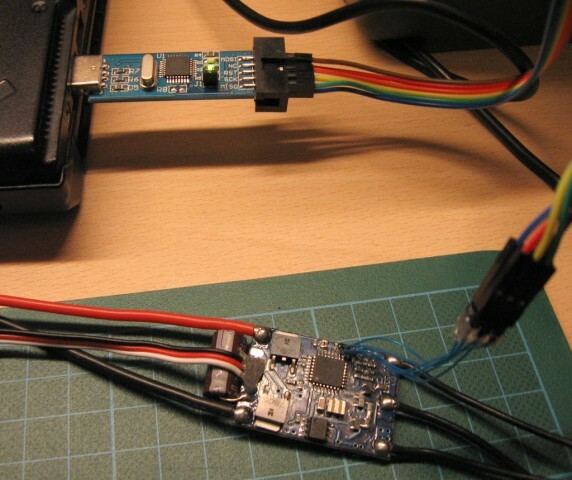 But for such programming you will need another device: Turnigy USB Linker or you could do it yourself using Arduino board and ArduinoUSBLinker software. In order to bootloader works, it’s needed to change BOOTSZ and BOOTRST bits, so new value of hfuse should be 0xca (or 0xc2 if eeprom should survive chip erase). avrdude: reading input file "0xca"
I recommend to connect ESC to battery first time using 10 Ohm resistor (few Watts recommended). 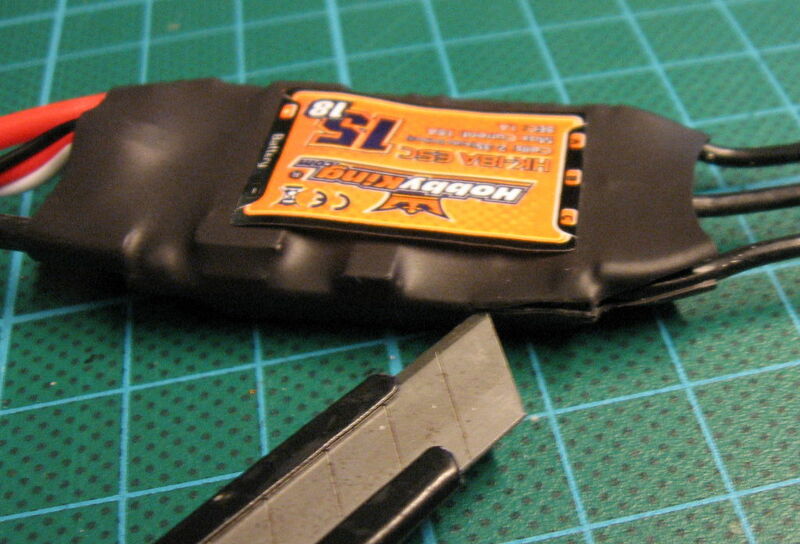 It’s value is small enough to allow motor start and run, but it’s also large enough that any software or hardware malfunction couldn’t burn your ESC. I changed because of defective Atmega8. How should I set the fuse. You need to use avrdude (it’s distibuted with Arduino for example).